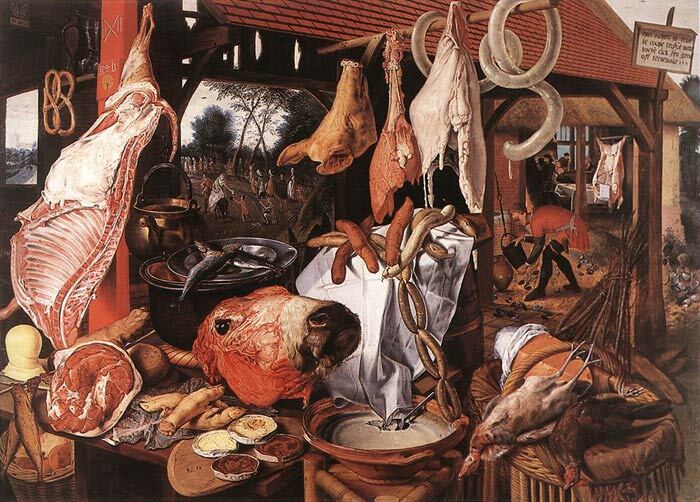 In this oil painting - Butcher's Stall, the viewer's senses are immediately assaulted by the profusion of life-size comestibles. Amid fowls, sausages, beef, pork, fish, butter, cheese and pretzel, the eye of a flayed ox's head disconcertingly seems to watch the viewer. Each object is a masterful still-life. Like Lucas van Leyden and some other Netherlandish artists, Aertsen inverted the traditional foreground-subject relationship; his narrative occurs in the background. Almost unnoticed at first, the stall permits glimpses of a tavern on the right and a landscape behind. The ground around the inn is covered with oyster and mussel shells, which in some context - as here - allude to their consumption as an aphrodisiac. Among the tavern's revellers is a prostitute with a possible customer. SPECIAL NOTE : The painter will make the reproduction as close to the original oil painting as possible. If you want your painting to alter from this likeness, please email us and " Butcher's Stall " will be reproduced according to your special requirements.